"Doll wearing habit worn by Religious Teachers Filippini"
Plastic doll is wearing a habit worn by the Religious Teachers Filippini, which was founded in Montefiascone, Italy in 1692 by Saint Lucia Filippini. The sisters arrived in the United States in 1910. 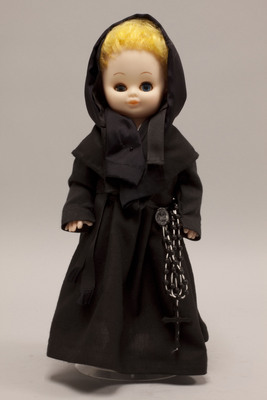 The doll is wearing a black habit with a black veil, bonnet, and sash, and a black plastic rosary hangs from her waist.